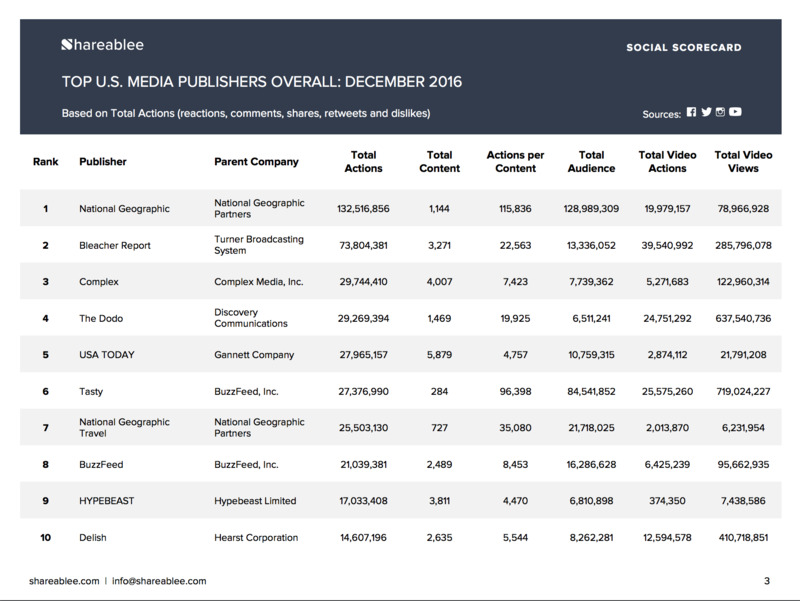 New York, NY, January 24, 2017	(Newswire.com) - ​​​​​​​​Shareablee today announced the top 10 U.S. Media Publisher rankings for December 2016, as compiled by the company’s social media measurement services. U.S. media publishers accounted for 1.6 billion total social actions (likes, comments, shares, retweets, dislikes), with 430 million actions from Instagram, 550.6 million from Facebook, 52.6 million from Twitter and 569 million from YouTube (excluding views) in December. 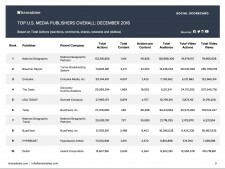 The media publishing industry represented 11 percent share of consumer actions U.S. brands in December. Total actions for the media publishing industry saw a 7 percent increase compared to November, driven in large part by a 15.6 percent increase in YouTube. National Geographic continued its dominance of the rankings taking the number one position with 132.5 million actions. Bleacher Report also maintained its second position, garnering 73 million actions. Both publication grew their total engagement by 5% since November, just above average for the entire top 10 list. Of the top 10, Complex saw the highest growth in engagement, at 20.4 percent. Complex’s category leading growth was driven by its investment in Facebook video -posting 47 percent more content, and seeing 167 percent higher consumer engagement. Top performing posts were videos featuring family life, with the top post about siblings bonding, capturing over 700,000 social actions. National Geographic's performance was driven by a combination of links, images and video. Its top post was a link to a tail of a 99-million year old dinosaur and it top image was a collection of the 52 best images from 2016. Both posts captured over 300,000 actions. Bleacher Report saw a 5.8 percent growth in December driven by its 11.9 percent increase in Instagram total actions. The media publisher’s top content featured photo memes from Craig Sager, Olympic athletes and Charles Barkley. The Top Five Publishing Brands on Twitter: Bleacher Report (7.5 million actions), Billboard (2 million actions), The New York Times (1.7 million actions), The Hill (1.3 million actions) and Buzzfeed (1.2 million actions).